I was out of town for a few days this week on a short trip to Asheville, NC, a knitter's paradise. I didn't have much time to shop around but I did get to a few shops. I am looking for a very particular Japanese stitch dictionary to add to my collection. I saw it at Stitches West but by the time I got back to the booth, it had been snapped up. Alas, no one had it. It was a slow week which worked out fine since I was out of town. Again, I blame the weather! Who wants to work on swatches when the weather is so lovely? The tip this week may not be of interest to knitters not taking the Basics course or doing the Masters program. However, this information would benefit any knitter. The importance of gauge cannot be overstated (if you want something to fit!) but most knitters give it very scant attention. I think the reason why is that we are so anxious to begin a project we skip this important step. The way NOT to measure gauge is to cast on 20 or so stitches, knit a few rows, and then grab a measuring tape, mark off an inch and count the stitches. This simply is not accurate and does not work. 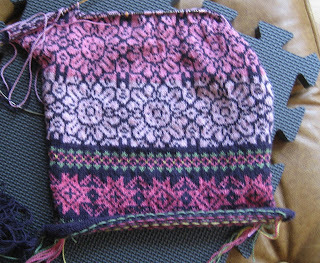 The first step is to work the gauge swatch a few days before beginning the project. The ideal time to work a gauge swatch is BEFORE you finish your current project. You will be less likely to skip steps. Look at the gauge statement for the project. It will specify the number of stitches and rows measured over 4 inches. It should also indicate the stitch pattern. 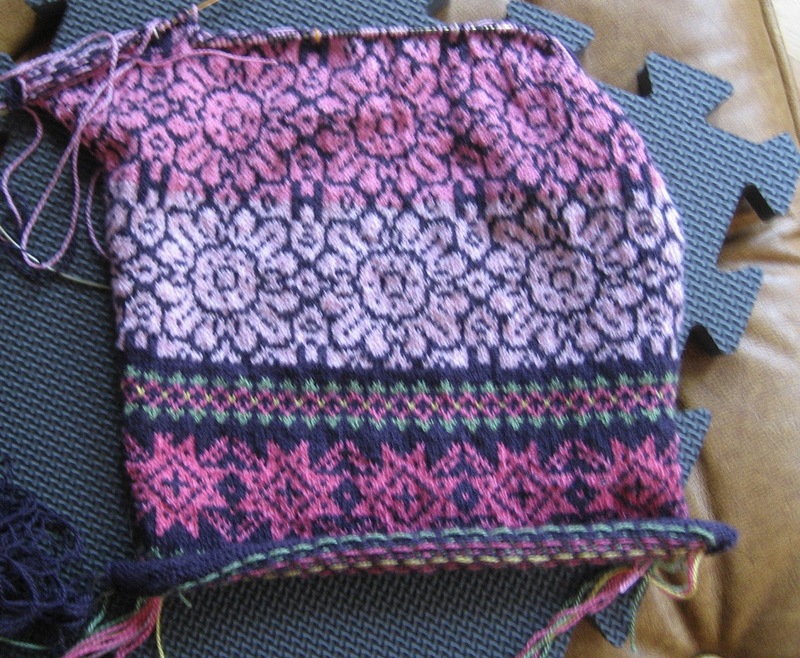 Cast on more than the number of stitches specified. Work more than the number of rows specified. 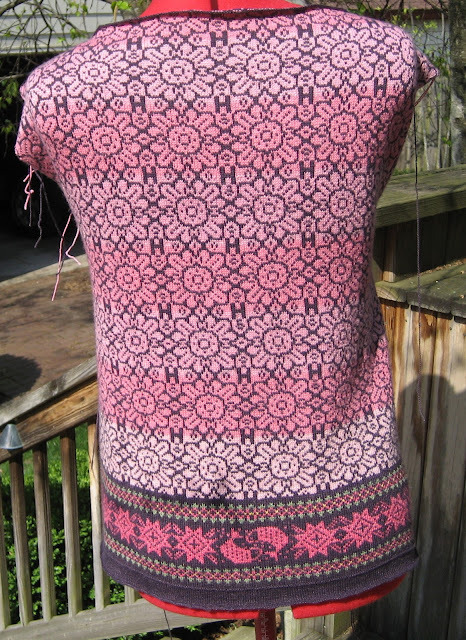 If the pattern is cable or lace, you might want to add a few stitches for a border. It will make measuring the gauge easier. BLOCK THE SWATCH!!!!!!! Most skip this step. 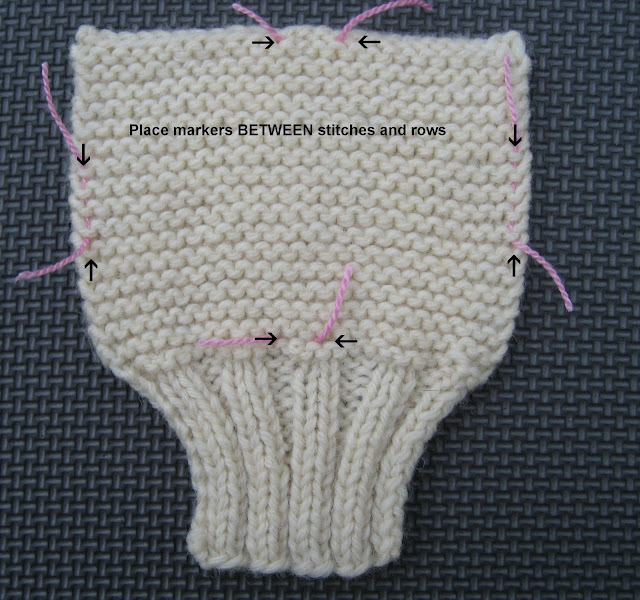 The gauge swatch should replicate how the stitch pattern will look on the finished project. This is particularly important for cables and lace. Mark the swatch for measurement. Keep the swatch. Don't rip it out. You might find it useful later! This week's tip concerns how to mark the swatch. Next weeks tip will be how to measure and calculate the gauge. DO NOT INCLUDE the selvedge stitches in the portion to be measured. They are not the same width as a stitch. DO NOT INCLUDE the cast on and bind off edges in the portion to be measured. They are not the same height as a row. 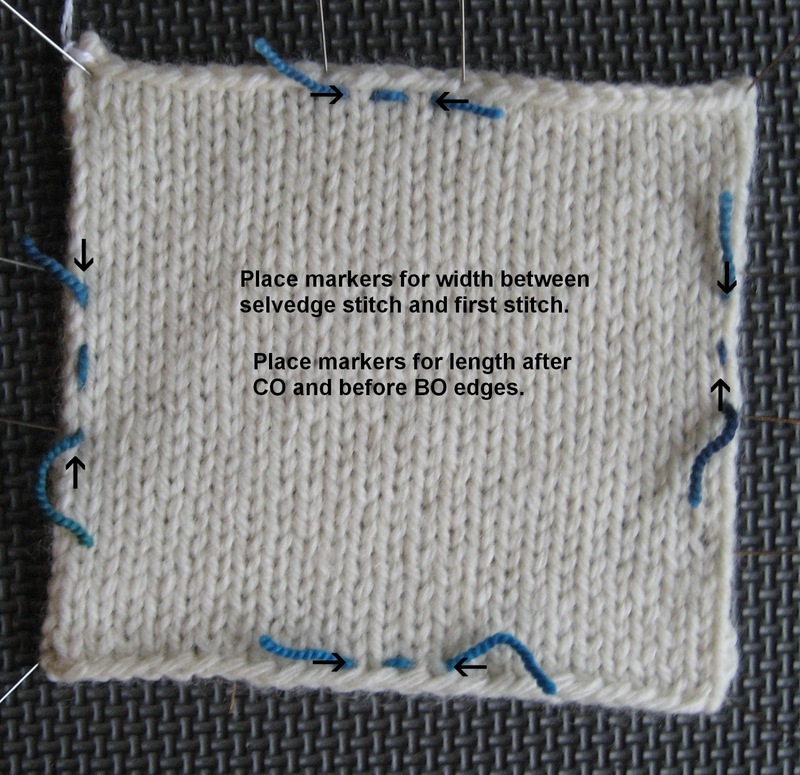 Place the width markers BETWEEN stitches, not in a stitch. Place the length markers between rows or before the bind off or after the cast on edges. 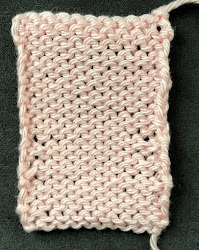 I have included photos of garter, stockinette, and seed stitch. It is pretty easy to mark stitch patterns like these. For the width, you just have to identify where a stitch begins and ends. 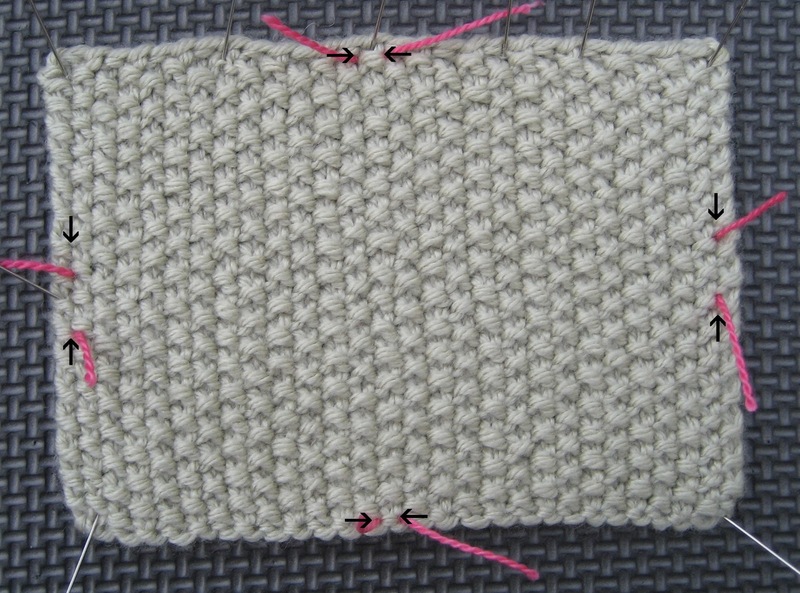 For the length, you have to exclude the cast on and bind off edges. Cable patterns are a bit different. Depending on the pattern the width will differ. For the best results, measure the swatch at the center points. You will get more accurate results if you measure complete pattern multiples. In the photo below, there are three patterns multiples. Measuring the swatch at the center will more closely approximate how the pattern will appear in a garment. The video shows how the markers were placed for these swatches: Placing Markers for Gauge video. 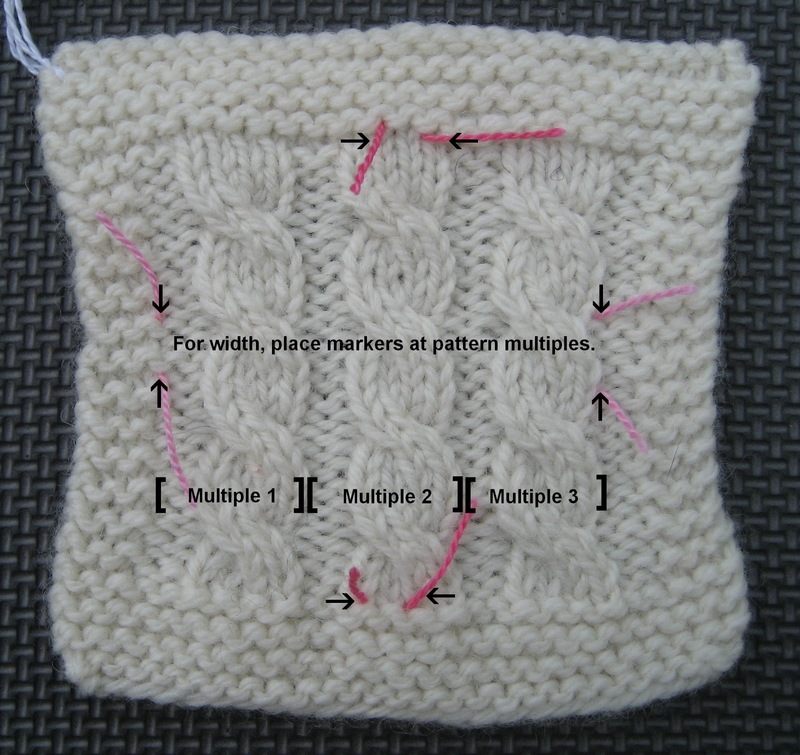 Next week's tip will cover counting stitches and rows and measuring the swatches. I'm still working on the Decoration Day sweater. I've finished and blocked the sweater body and am now working on Sleeve 1. I went ahead and sewed the shoulder seams. The sleeves have the same border design as the sweater body, minus the fish. I hope to finish up Sleeve 1 and most of Sleeve 2 next week. Excellent illustrations. I've heard how to measure row gauge but still have found it challenging. I must confess, I've found it easier to measure row gauge on the WS of a St st swatch because you can look at ridges like you have with garter. Much easier that way.